Pennsylvania isn’t exactly known for fun in the sun, which is probably why many residents opt to make their own with private inground pools. The climate actually varies a lot in the Keystone State, but there are few places where a swimming pool doesn’t add to summertime enjoyment. Like other eastern states, Pennsylvania doesn’t have a particularly long swimming season, especially in the mountainous interior. Still, most pool owners get at least a few months’ use out of their pool before temperatures start to dip too low. An electric pool heater can maximize not only the number of days you can use your pool, but also the number of hours during the day because it can make early morning swimming comfortable. 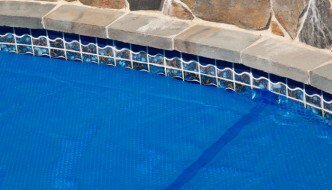 As mentioned, a pool heater is recommended – in fact, it’s more of a necessity than an “extra.” For a truly optional feature that will enhance the use of your pool, consider a pool enclosure. You can get an enclosure that completely houses your pool, allowing for winter swimming, or one that merely blocks the rain. Either type makes sense for a lot of areas of Pennsylvania. Construction labor costs are slightly higher than the national average, making inground pool construction in Pennsylvania a little pricier than other places. Still, the benefits of hiring a professional pool installer is likely well worth the extra cost. If you want to save money, you can do some of the unskilled labor (ie digging) yourself. However, we do not recommend automatically selecting the pool builder who comes in with the lowest bid, especially if that bid is unrealistically low. No matter where you live in Pennsylvania, you will likely need to get a pool permit. A fee may be required on submission, and possibly annually as well. These sorts of property permits and fees are determined at the local level, so check with city authorities to make sure you understand what is needed. Experienced pool builders can often handle permits as well, or at least guide you through the application process. Pool safety laws are a municipal issue. However, most cities – including Pittsburgh and Philadelphia – have adopted uniform standards. The main law that impacts prospective pool owners is the one that requires a four-foot fence to surround any private pool. In addition to the height requirement, there may be other minimum standards specified by your city, such as a self-closing gate that opens away from the pool area. In other words, many existing backyard fences may not meet the requirements of a pool fence. If you have any doubt about whether you’re compliant, check your local laws to be sure.